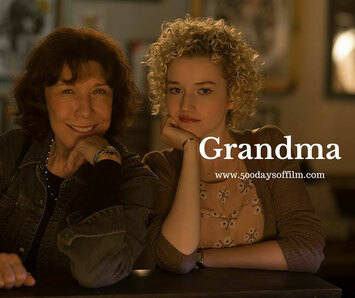 Having just broken up with her girlfriend and still grieving the loss of her life partner, Elle Reid (Lily Tomlin) is faced with the arrival of her granddaughter, Sage (Julia Garner). Sage is in trouble. She is pregnant but in no position to have a baby. She has an appointment scheduled for an abortion but she does not have the 630 dollars that she needs to pay for the procedure. The trouble is, neither does Elle. The two women have until sundown to find the money and so spend the day paying unannounced visits to old friends and flames to try to scrape together the cash. Their journey rattles old skeletons, digs up old secrets and makes both Elle and Sage reassess their lives. I absolutely loved Grandma. Somehow, I just knew that I would. Perhaps it was the post Sundance Film Festival buzz. Perhaps it was the reviews. I think it was mostly because of its star - the fabulous Lily Tomlin. Director Paul Weitz created the role of Elle for Tomlin after working with her in the movie Admission. And I can’t think of another actress who could have made this part work. Tomlin is superb. She is funny, feisty and not always altogether sympathetic. However, she is open minded and there when her granddaughter needs her. She is supportive and protective. The scene when Elle confronts Sage’s boyfriend is just priceless. Grandma’s screenplay is clever and very funny - I laughed all the way through this movie. Tomlin delivers her lines with ease but Garner also more than holds her own. The two women give equally engaging and powerful performances. In less classy hands, this film would have probably been called Dirty Grandma. Eeugh… I can’t even imagine how awful that movie would have been (probably something similarly soul destroying to Dirty Grandpa). Thankfully, Weitz has written and directed a sensitive and sympathetic film where we laugh with Elle and not at her. Grandma reminds us of the achievements of feminism and celebrates the right we have to chose what we want from life. I would highly recommend Grandma - films this smart, funny and poignant just don’t come along all that often. Paul Weitz’s directorial debut was American Pie. He and his brother Chris also wrote and directed About A Boy, which received an Academy Award for Best Adapted Screenplay. Grandma was a hit at the 2015 Sundance Film Festival. The film closed the festival. If you have, what did you think of this movie? Did you enjoy it as much as I did?